Hello! Thanks for visiting today for Just-A-Scrappin' 2-5-2015 Challenge using the theme Hearts make a cards, layouts, 3D projects or altered art item. All embellishments, paper and card stock is from my stash so I do not have all the names of the companies. 1. I started with pink with red heart paper and folded it according style. 2. Today I'm using some old die cuts from different Cricut Cartridges. Using 3 hearts to form flowers, adhered with Tombow permanent adhesive, added to first row of card and placed yellow stickers for centers. 3. 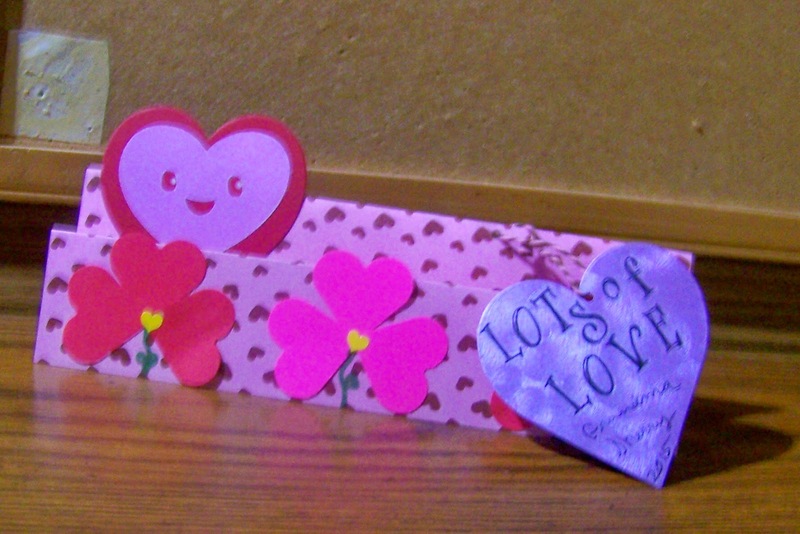 Then added the another die cut heart to a larger heart, adhered with Tombow permanent adhesive to the card's second row. 4. I drew in steams with Bic Mark-it Forest Green. 5. For a tag I used a larger heart with Deja View Wonderful Words sticker added a sentiment. I'm with Kim-great to see different designs-thanks for the inspiration!